IBS Hyderabad (Faculty of Management Studies) is a constituent of the ICFAI Foundation for Higher Education, which is declared to be a Deemed-to-be-university under Section 3 of UGC Act. 1956. IBS offers high-quality programs in different areas of management to a cross-section of students, executives and professionals across India. IBS has a reputation for innovative program design and delivery, quality courseware, personalized instruction, strong industry interface, research, consultancy and publications. Since its establishment in 1995, IBS has grown impressively and achieved widespread recognition from business and industry, academic circles, and professional bodies. The campus at Hyderabad is a 91 acre lush green campus with built-up area of over 10 lakh sq.ft. The fully residential campus is equipped with state-of-the-art facilities. Different academic blocks are available with classrooms, lecture theaters, tutorial rooms, conference halls, seminar halls, auditorium, library, computer lab, faculty rooms, meeting rooms, administrative offices, academics office, student support services office, and career management center. IBS seeks to provide a high quality learning experience, in an adaptive environment, with a focus on relevance, rigor and research. The mission of IBS is to develop ethically-grounded professional managers who can add value to the organizations and communities to which they belong. 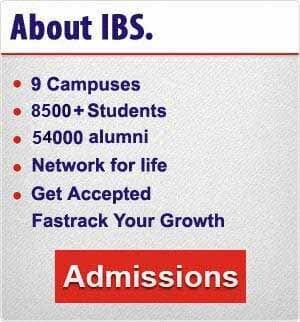 IBS has a growing alumni base of over 6,600 who are currently pursuing fast track careers with 500 plus companies in India and abroad. IBS, Hyderabad is one of the top business schools in the country. As a business school known for excellence in management education we develop the resources with right set of knowledge, skills and attitudes to meet the requirement of the corporate world. Our vision is to develop lifelong resources to the industry by integrating teaching, research, institution building, knowledge sharing and community development (coined as IBS TRICK). We have faculty member’s pool with a blend of strong academic experience and strong industry experience which ensures richness in ensuring IBS TRICK. We strongly believe return on investment (ROI) depends on return on knowledge (ROK). The curricula of IBS are industry orientated with case pedagogy, comparable with the best practices of the globe, ensure return on knowledge. As a result of richness in curricula, case pedagogy, industry recognition and accreditation of both national and international the institute has attracted collaborations with best foreign business schools. We have about 30 student clubs both curricular as well as co curricular related. By involving the students in these clubs our students understand nuances related to managing people, understanding the behavior of people, leadership skills and working with team which is the key to become successful managers. Worth to mention about our syndicated learning activity that nurtures the students on the areas of current affairs, general knowledge, domain knowledge, group discussion skills, attitudes and behavior. After successful training through syndicated learning activity the students get exposure on mock group discussion, mock company test and mock interview where industry experts involves to conduct mock interviews which improves their ability to get placed by aligning their Knowledge, Skill & Attitude which are the key requirements of the job market. Through our summer internship program (SIP), our students get exposure to the dynamics of the professional corporate culture which develops the cognitive Skills among our students. Continuous interaction with industry, experts talk and feedback forms the base for upgradation of the curricula which differentiates IBS from other business schools. Corporate relation cell, alumni network, management development programs, corporate network and mentoring have enhanced the skill sets required to get placements. Silicon India recently interviewed Dr. S.Venkata Seshaiah, Director, Program Head, IBS Hyderabad about importance of management education in india and overall MBA education scenario. Read the interview by clicking here. J.P. Morgan Services India Pvt. Ltd.
Deloitte Financial Advisory Services India Pvt. Ltd.
Emedlife Insurance Broking Services Ltd.
Home First Finance India Pvt. Ltd.
Urenok Software Solutions Pvt. Ltd.
WNS Global Services (P) Ltd.
IBS is consistently ranked among the top B-Schools in India, in the annual B-School surveys every year. IBS-Hyderabad is among the first three B-Schools from South Asia to be SAQS accredited by AMDISA. The South Asia Quality Improvement System (SAQS) has been developed by Association of Management Development Institutes of South Asia (AMDISA) and European Foundation for Management Development (EFMD) as a special project under the Asia Link program funded by the European Union. Some more reputed B Schools also have received SAQS accreditation and many more are seeking it. IBS Hyderabad was among the first B-Schools to be graded by CRISIL with a grade of A** at the national level and A ** at the state level. Hostel facilities are available to students. Sports plays a vital role in all-round development of students. A wide range of indoor and outdoor games facilities are available. Indoor games facilities like chess, caroms, table tennis, etc. State-of-the-art courts for Badminton, Basketball, Squash and Volleyball. The academic infrastructure is equipped with the best of facilities to enhance the quality of teaching and learning process. Lecture theatres and classrooms are designed to facilitate the case pedagogy that IBS has adopted. All lecture theatres and classrooms are networked and wi-fi enabled and fitted with audio visual tools to enhance the teaching-learning experience. The IT infrastructure and library provide the support to make available to faculty and students up-to-date knowledge and information for learning, research and consultancy. Simulation softwares are available to help students relate to real-life dynamics while taking business decisions. The seminar halls and auditorium are centers where experts from industry and academia share their life experiences. The complete academic monitoring and control is done through the intranet – the CampusNet and the Faculty Zone. The CampusNet is the portal of communication for students on academic matters, library, placements, accounts, hostel etc. The Faculty Zone is for the faculty research and academic activities and HR and accounts information. The campus has a large and well qualified faculty pool. The faculty members are involved in research, case development and industry consultancy. Many of the faculty members hold doctoral qualifications and have rich industry experience. Hyderabad campus is equipped with the latest state-of-the-art technology of computer network with high speed backbone and security through CISCO high end routers. Hostels are wired to link with the campus high speed network backbone, the auditorium and classrooms are also connected with the local high speed LAN for facilitating faculty for teaching and accessing databases. Video conferencing facility is available for sharing lectures and group discussions with other national and international institutes and also in extensive use by prospective employers for placements. The campus has exclusive subscription of Microsoft products viz. Windows XP, Office 2007, Microsoft exchange, SQL server etc, Adobe products (PageMaker, Acrobat, Photoshop etc.) which are being used in day-to-day operations. For teaching, labs are licensed with SAP, SPSS, SAS, iThink, Rational Rose, Eviews, Microsoft CRM, AutoCAD, Cadian Advanced CAD etc. 100 mbps of high speed Intranet is extensively used by students and faculties for academic purposes. Students have built campus radio on the local LAN for information to the students about the latest happenings, announcements and entertainment. Library is equipped with latest software packages and a large collection of books, CDs, videos, Indian and international journals; magazines and research reports, relating to management and allied subjects. IBS subscribes to several academic online databases like Ebsco business source complete, Econlit, Academic search complete, Emerald management extra, ProQuest, JSTOR and Cabells directory; industry databases like the World Development Indicators; CMIE databases (including Prowess, Aefa, CapEx, Business Beacon and Industry Analysis Survey) and Capitaline and business and research oriented online databases like Reuters, Business Insights and Marketline. The library is fully supported by the IT infrastructure. The library services are computerized with Lib-Suite Web enabled library software which facilitates automated identification, reservation and circulation of books. Barcodes and scanners are used to issue books. A web based catalogue is also available on the internet for inquiring about the books. Guest Lectures, Debates Soft Skills Workshop. Big Fights, Business Plan Competitions, Guest Lectures, Quiz Competitions etc. Entertainment Zone for the Students. Forum for young entrepreneurs with innovative ideas and creative minds. Business Plan Competitions,Guest Lectures, Debates. Guest Lectures, Debates, Quizzes, Panel Discussion. Dr. S.Venkata Seshaiah is a professor and Director at ICFAI Business School, Hyderabad, a constituent of IFHE deemed university. He holds a MA, M.Phil, Ph.D. (Econometrics) from Sri Venkateswara University, Tirupati, and Andhra Pradesh. Prior to joining IBS, he was associated with BITS Pilani, Rajasthan as a faculty member in the Department of Economics and Finance., then with Siva Sivani Institute of Management,Hyderabad and then with Kirloskar Institute of Advanced Management Studies, Harihar, Karnataka respectively. He also worked in NCAER as field Investigator.He has got 25 years of teaching and research experience. He has published several research articles in the area of economics and finance in the reputed journals of National and International Journals. He was a Consulting Editor for ICFAI Journal of Applied Economics and he also edited several books in the area of issues in economic development. He is also a scientific advisor for National and International Journals. His areas of interest are financial economics, capital markets and development economics. Sivaramakrishnan worked with Karvy Commodities Broking Ltd as Manager for 2 years where he headed a team of commodities research analysts. In Dec 2005 he left Karvy to commence a new company called KOMBENCH along with 3 other alumni from IBS Hyderabad. KOMBENCH is a commodities broking house with presence in Dubai and India. KOMBENCH aspires to become an –Alternative Investments Facilitator– with Private Equity, Hedge funds and Venture Capital being the growth path. 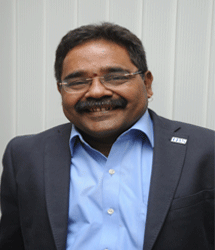 Sivaramakrishnan completed the three level of CFA course from the US (AIMR) in June 2006. He along with his partners dreams of making KOMBENCH a billion$ turnover company. Sanjukta is an alumna from the Class of 2003 of IBS Hyderabad. She is currently working with The Neilson Company as a Consumer Analyst and is based at Canada. She has worked as a Team Lead in the Client Solutions Group of IRI in Symphony Services for over 2 years. Her domain is Market Research and she works with Household Panel data to study consumer behavior trends of Consumer Packaged Goods in the US market. Before joining Symphony Services, she worked for a year in a Market Research firm in Hyderabad. On a personal note, her family lives in Calcutta and comprises her brother, sister and parents. While living in Calcutta, she completed a Diploma in singing Indian Classical songs. In her free time, she loves to do glass-painting, loves reading (mostly fiction; slow reader so takes a long time in finishing a book), listening to music (all types – Hindi, English and Indian Classical), watching plays and movies, spending time with friends, attending music concerts. Chinese food is her favorite, but she loves trying out different types of cuisines as well. Reading has been her strong passion since childhood. Even though she had been too much crunched on time to pursue that in the past few years, she is happy that she is catching up once again. IBS Alumni are working in over 900 blue chip companies and are spread out across the World.